It has been a busy year with the majority of my time devoted to training. As busy as I've been, the holiday season is a chance for me to give thanks to all the amazing people who made positive impact in my life for the past year. I feel truly blessed that I am surrounded by so many. Baking holiday cookies iss out of the question considering the scale of production it involves (it's hard to top my 2008 extravaganza including ones for vegan too). However, I still want to create treats that are enticing, but streamlined. Candy and chocolate making is not something I'm familiar with. The precision required is even less forgiving than baking. Of course there are always shortcuts. Besides, "Candies By Candy" does have a nice ring to it. After flipping through pages of information, I decided that an assortment of chocolate fudge is a good balance between rate of success, creative outlet, and required effort. My goal was to complete this entire project in the span of one weekend. I set out to purchase material last Friday and made my first batch of Dark Chocolate Espresso Fudge. I adapted a Martha Stewart recipe and eagerly awaited the result. Would the fudge firm up as expected? What about the taste? Luckily it turned out to be one beautiful batch of fudge with the espresso deepening the chocolate flavour. As I beamed proudly in my kitchen, I suddenly remember that I did make fudge before! For the sake of variety and curiosity, my next batch was Dark Chocolate Walnut adapted from America's Test Kitchen. The texture between the two is very different with the former being softer, creamier, and sweeter. I like them both for different reasons. For the next three batches, I returned to the Martha Stewart recipe using variations of my own. By the end of the weekend, I added Milk Chocolate Ginger Cardomom, Milk Chocolate Peanut Butter, and White Chocolate Pistachio Rose to the selection. Line a 9x13 pan with wax paper or parchment. Melt chocolate over a bain marie. In a medium pot, combine butter, cream, sugar, salt, and marshmallows. Cook over low heat for about 5 minutes until marshmallows start to melt. Turn the heat to medium heat and bring mixture to a boil. Cook for 5 minutes. Remove chocolate from heat. Pour the sugary mixture over the chocolate and add vanilla. Gently stir until it's homogenous. Pour into prepared pan and leave at room temperature until cool. It probably will not set yet. Pop the pan in the fridge overnight for everything to firm up. Unmold fudge from pan. Trim the sides and cut into neat 1x1 inch squares. For easiest handling, put each square in a glassine candy cup so you can move the candy pieces around without touching them. Store in an airtight container at room temperature. The fudge may dry out a little but no big deal. dark chocolate espresso: Use dark chocolate. Add in 2tbsp instant espresso such as Medaglia D'Oro along with vanilla. milk chocolate ginger cardomom: Use milk chocolate. Using 2 or 3 chai teabags, infuse the cream with chai flavour. Strain and cook the cream with butter, sugar, salt, marshmallow. If the flavour is not strong enough to your liking, add in 1/2tsp each of ground ginger and cardomom. milk chocolate peanut butter: Use milk chocolate. Reduce sugar to 350g. When combining the sugary mixture with chocolate, stir in 300g creamy peanut butter (I prefer Jif) at the same time. Top the fudge with salted roasted Virginia peanuts. white chocolate pistachio rose: Use white chocolate. Stir in 1 cup of coarsely chopped unsalted pistachio and 2tbsp of rosewater instead of vanilla. Because of the lower cocoa butter content of white chocolate, this fudge is very soft even after overnight in the fridge. For easier handling, I put it in the freezer to firm even more before unmolding and cutting. It definitely benefits from a bit of air-drying before packing them into boxes. Those of you who know me probably can guess that packing the fudge pieces into pretty boxes was my favourite part of holiday baking/candy-making. The box I used is a simple white cardboard embossed with flowers. 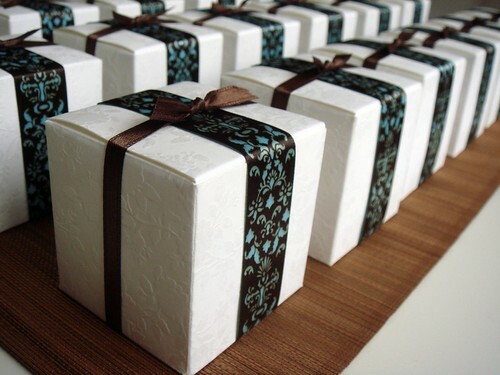 It looks really dorky on its own but when paired with the French block print brown and blue ribbon, the finished gifts look very elegant instead. Each box is lined with 2 strips of wax paper to prevent grease marks from the candies. Each layer is seperated by a square of wax paper and cardstock trimmed with pinking scissors to continue the lacey flowery pattern theme. 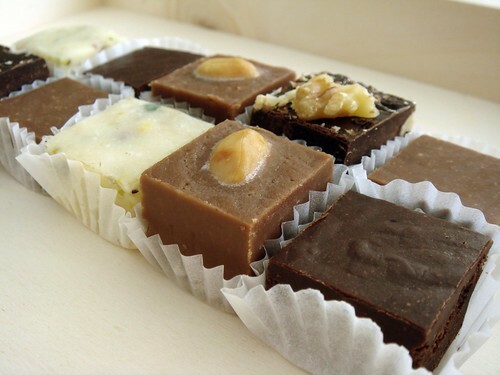 There is a total of 3 layers so each box contains 12 pieces of fudge snuggly fitted. I was amused to see my friends' faces when they held the unexpectedly heavy (but tiny) boxes.